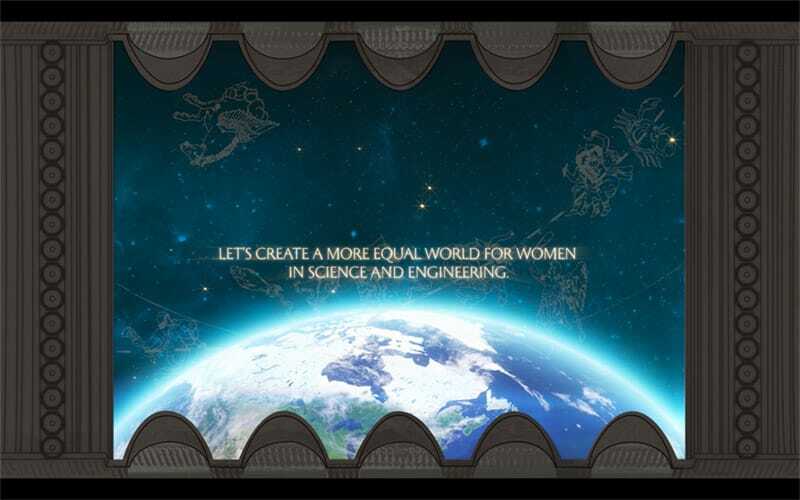 Here’s the 360° immersive experience of “Unseen Stars”, GE’s light show at Grand Central Terminal in New York celebrating the achievements of female scientists and engineers. It was scheduled to run September 19-21, but it’s been extended through Friday, September 22. Go see it if you can. 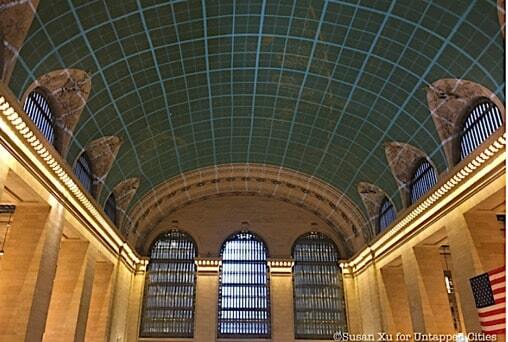 The celestial ceiling at the terminal is one of the glorious spaces in NYC (and a source of endless mystery). And its curved design serves as a stunning projection screen. With the women’s faces emerging from the starry background, it seemed immersive even without 360° video. Almost like a huge IMAX screen suspended over your head. Preparing for the Unseen Stars light show on Tuesday. The show itself is a 7-minute projection, featuring the faces of 12 female scientists and engineers, including Megan Smith, the first female U.S. Chief Technology Officer and Laurie Leshin, Ph.D, a geochemist in search of life on Mars. In keeping to the already existing celestial-theme of the terminal’s ceiling, the custom-designed animations were based on iconic constellations, and set in a fabricated universe. Here’s the 360° immersive experience of the light show – the best way to see it other than in person. Be sure to go to full screen on this and scroll around (and look up!) if you’re doing this in a browser. 360° video often gets a bad rap these days as not being true VR. And we agree, it’s not full virtual reality. But it still provides an immersive experience. The larger problem is that it’s often used for the wrong purposes – where traditional video would be better. But the 360° immersive experience of Unseen Stars is an example of where it works incredibly well. Grand Central was designed as an expansive space, an environment that would overwhelm your senses when you stepped into it. In the 360° video here, the experience breaks free of the camera’s frame. It’s easy to use and comes with a ready distribution platform (YouTube). In other words, it can be an excellent solution given where our immersive technology is today.
. . . 32 Christie Digital 4K20 30,000 lumen projectors (a total of 960,000 lumens) to project its images onto the ceiling. Sixteen projectors were set up over custom truss structures erected on the north and south of the terminal, over a balcony above the escalators, and over the ramp from Vanderbilt Hall to the Main Concourse. The event runs only through September 21st – though they’ve extended it through Friday. I’ve been fortunate to see it all three days. Indeed, you won’t see me but I’m in the 360° video, off in a corner staring at the ceiling. But in the end, none of the technology is important here. Unseen Stars is an incredibly moving experience. Perhaps it will help us rewrite our history to include all the STEM stars in the heavens. Not just the boys.